Including a rising or setting moon can turn an ordinary landscape image into something special. Of course, like most things worth doing, moon photography adds a couple of layers of complication: First, there’s the matter of getting there when the light’s right and the moon is in the right place (it does little good to arrive as the moon rises if it’s skewed 90 degrees from the scene you came to photograph); and once you have everything lined up, you still have to contend with the often tricky exposure issues. Many factors, some within our control, others completely beyond our control, determine the position, phase, and visibility of the moon at any time. We may not be able to control earth’s rotation and the moon’s orbit, which determine the moon’s phase and absolute position in the sky, but we can control our location, and take the steps necessary to align the rising or setting moon with the landscape we wish to photograph. A full moon rises and sets directly opposite the sun, rising in the east at sunset and setting in the west at sunrise. This actually makes perfect sense when you take a little time to understand the monthly choreography of the earth, moon, and sun. Just as the earth revolves around the sun, the moon revolves around the earth; at any point in this dance, half of the earth is lit (daytime) and half of the earth is dark (nighttime), and half of the moon is lit and half of the moon is dark. Visualize a photon of sunlight that starts at the sun and follows a straight line that passes through earth and continues into space: On its 29+ day journey around earth, the moon will cross that line twice, passing in front of earth once and behind earth once (as viewed from the sun). On the day the moon intersects that line behind earth (earth is between the sun and moon), we on earth are perfectly placed to see the fully lit moon when we look toward the sky opposite the sun (the night sky). On that day only, as the point of your location on earth rotates from day to night, you’ll see the sun disappear in the west as the moon rises in the east. On that day, as earth keeps rotating away from daylight and deeper into night, the full moon rises higher and higher, reaching its highest point around midnight, then dropping as your location rotates back toward the sunlit side (sunrise). The next day the moon will have moved off that line and you’ll be able to see less of its fully lit side. So then why do we rarely see a full moon rising exactly as the sun sets? That’s because: 1) the point of maximum fullness (when the sun, earth, and moon align perfectly) only happens at one instant on the full moon day—at every other instant of each month’s full moon day, the moon is only almost full (but still full enough to appear full); 2) sun/moon rise/set times we see published always assume a flat horizon—if you have mountains between you and the horizon, your view of the actual sun/moon rise/set will be blocked; and 3) The more extreme your latitude (angular distance from the equator), the more skewed the sun/moon alignment appears. Due to its monthly orbit about the earth, each day (or night) the moon rises a little later and gains or loses a little bit of its disk (the farther it has revolved from that sun->earth->moon line, the less of the moon’s lit side we see). So the night after the moon is full, it rises after sunset and is a little less full. The next night it rises a little later still, and is even less full, and so on. Eventually (in a little more than two weeks after it was full) the moon has revolved all the way around the earth until it lies between the earth and sun (now our imaginary line goes sun->moon->earth); all of its sunlit side faces away from the earth and we have a new (invisible from earth) moon. Those who don’t do a lot of moon photography are amazed at how much the moon shifts above the landscape throughout the year—in Yosemite you can sight a full moon rising between Half Dome and El Capitan one month, and a few months later it’ll be rising above Leaning Tower (far to the south). Fortunately, like many things in nature that appear random to the uninformed, there is actually nothing random about the moon’s location once you take the time to figure it out (or let someone else figure it out for you). If the idea of figuring anything saps the pleasure from your photography (or sends you into a panic), you’ll be happy to know that sometimes it’s enough to simply know that the moon will be rising in the east a little before sunset. This info is available in many places, in many forms, but in recent years I rely on my Focalware app; the most complete sun/moon website I’ve found is the US Naval Observatory website. Armed with that knowledge, you can go out to a location with a view of the eastern horizon, wait for the moon to appear, and start shooting. My old fashioned way (old trick for an old dog): I figured out my technique for locating the moon long before computer software and smartphone apps took away most of the effort. Nevertheless, I continue to do it this way because I’ve already done all the hard work (figuring out how to do it), I can do it in the field, with zero connectivity (no wifi or cell signal required), and I kind of enjoy it. After relying for years on a the US Naval Observatory website for the info I need (moon phase and moon/sun rise, set, altitude, and azimuth), I now get all the pertinent data from my Focalware iPhone app (I never said I’m opposed to new technology), plugging it into my National Geographic Topo! (that’s NG’s exclamation point, not mine) mapping software (discontinued) to plot the direction of the moon’s rise/set. To determine when the moon will appear above (or disappear behind) the surrounding terrain, I plug distance and elevation information from Topo! into the trigonometric functions of my HP 11C scientific calculator (originally an actual calculator, but now also an iPhone 11C emulation app) to compute the elevation in of my horizon. Software (the better way for 99.999 percent of you): I used to think that The Photographer’s Ephemeris (a free computer download or fairly inexpensive smartphone app) was the most complete solution for locating the moon, but that honor now goes to PhotoPills—I probably would have never taken the time to figure out my technique had these resources been available. Not only they give you the sun and moon’s location and elevation above the flat horizon, they also figure out the the actual (terrain included) horizon. The downside is that because they need to download maps, they require connectivity and are best used in advance of your shoot (usually not a problem). You do have the option to download the maps to your device for offline access—if I were a PhotoPills or TPE user, I’d be doing this before every trip. Many people are frustrated that the moon appears so large in person, but so small in an image. This doesn’t really bother me because I think even a small moon makes a great accent that can elevate an already nice scene to something special. But if you do like the moon large in your frame (without cheating), find a subject that can be viewed at a great enough distance to be photographed with an extreme telephoto, then figure out when the moon will be aligned with it. Take a look at the two images above: Though Half Dome occupies more or less the same amount real estate in the frame (albeit at slightly different angles), but the first image was captured from less than 3 miles away, the second one from 8 miles away. My rule for photographing a rising/setting full moon is that I must capture detail in the landscape and the moon. Since the post-sunset landscape is in full shade, and the moon is as bright as a sunlit landscape (because it is a sunlit landscape), the dynamic range of a full moon scene is pretty extreme, often too extreme for a camera to handle with a single click (always my goal). If my landscape is black (or just too dark), or my moon is a white disk (or blob), my image has failed. But here’s the great part—given that the moon rises about an hour later each day, and the full moon rises at sunset, then it stands to reason that the day before it’s full, the moon will rise about an hour before the sun sets. Factoring in the terrain on the horizon (and assuming you’re not at the base of a mountain that forces you to look straight up to see the sky), that means that the day before the moon is full is often the best opportunity to photograph a nearly full (say 97%, give or take a percent or two) moon rising in the east above a landscape painted with the warm sunlight of the golden hour (such as the Half Dome images immediately above). 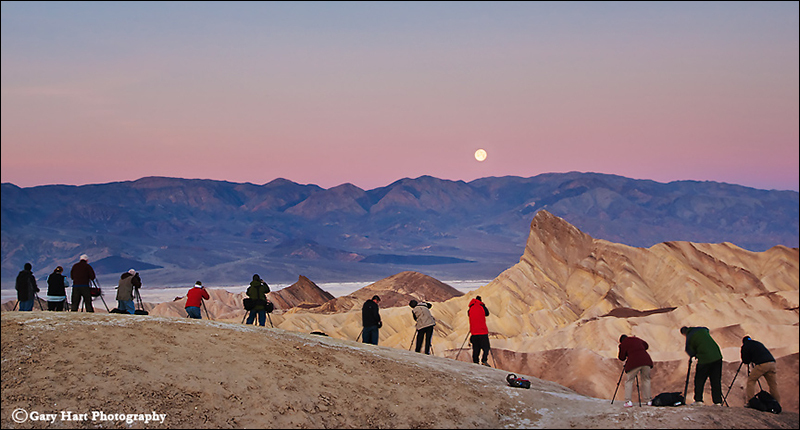 Conversely, if your view is to the west, you can photograph a nearly full moon setting above a scene bathed in warm sunrise light the day after it’s full (like the Mt. Whitney moonset image at the top of this page). Either way, the day before or after the full moon gives you everything you need to capture your scene in nice, photographable light that’s still sufficient to hold the moon’s highlights at bay. The final piece of exposure advice I’ll add is to make sure your camera’s blinking highlights (also called highlight alert) are turned on (as far as I’m concerned, they should be set anyway because I see no downside to highlight alert). The moon is usually so small in your frame that it won’t register in the histogram, which means blinking highlights are usually the only way to know that you’re blowing out the moon. I monitor my highlights closely after each exposure and have found that, when shooting raw (jpeg shooters don’t have as much margin for error), I can usually recover enough detail with an exposure 2/3 to 1 stop brighter than the exposure that first showed blinking. Once I’ve reached the maximum lunar exposure, I keep shooting until the foreground becomes too dark to recover usable detail. Very useful information Gary, many thanks. Well put, Gary. One other reason why the moon and sun don’t always do a synchronous rise-set dance when the moon is full is because the moon’s orbit is inclined by 5 degrees to the plane of the earths orbit around the sun which effects the rise/set time of the moon relative to the sun. The exact moment of the full moon is defined as you described, when the moon is exactly opposite the sun from the earth. For that reason the full moon can occur at say, 10:00 AM – when the moon is not visible locally – but of course for someone, somewhere on the planet at that moment the moon is rising for someone and setting for someone else. I’ve been chasing the moon and sun for quite a while. Always a great pleasure when everything works well. Finally, in addition to TPE, there are several new apps, like PhotoPills that aid greatly in the calculations. I’ve yet to find one that completely does the job, however. Very helpful, Gary. Thanks for the clear explanation of the moon’s cycle. I look forward to experimenting more with moon photography. Beautiful image. Thanks for all your help at the workshop in Bryce Canyon. My pleasure, Kathy, it’s great to hear from you. As always, really great information. thanks for sharing. This is a great tutorial. I learned a lot of things I’d like to try. Quick question: do you have a preference for F stops when trying to get detail in the moon? Or is it more a question of under-exposing a little? I see that you used F11 for a few of the images. Thanks, Kavi. As far as your camera is concerned, the moon is at infinity regardless of the f-stop, so it’s best if you use your sharpest apertures. That generally tends to be in the f8-f11 range, but you can test each lens to find its sweet spot. The other thing to be careful about is avoiding diffraction, which usually means f11 or smaller. Thanks for sharing. I’ve shot the moon many times on Kauai and Big Island both “straight” and “cheating”. Since I’m shooting ” art” and not journalism, I don’t call it cheating. While I already knew almost all the info in your article I always enjoy reading photo tips. 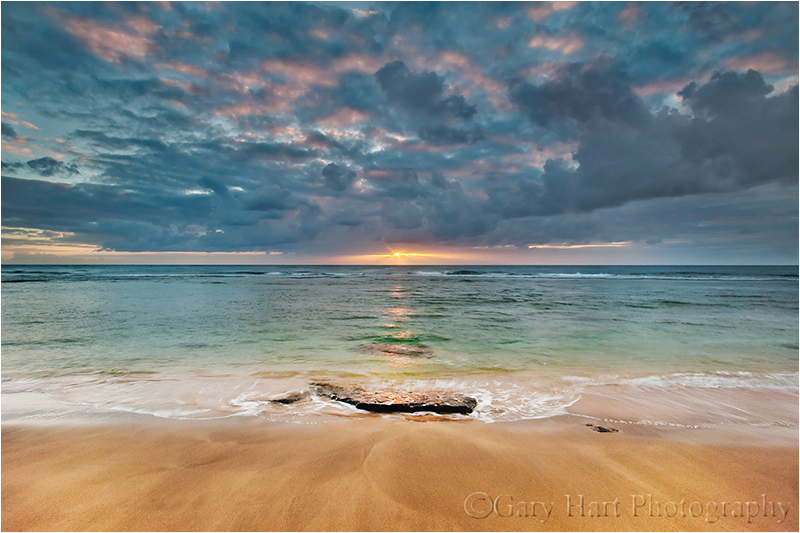 If you’d consider a workshop on Kauai, I’d like to apply as an assistant/guide. Alohadios. Jock happy 2016. Beautiful images! Capturing the moon is landscape just adds that extra bit of majesty to any photo.